Wind over Fire has an extraordinary healer and yogi coming from September 29th through October 2nd! Mas Vidal, who endorses a lifestyle that heals, revitalizes, and awakens us spiritually through yoga and Ayurveda. Mas has dedicated himself to the great Vedic sciences of Yoga and Ayurveda. In this tradition, Veda is knowledge and Yoga is practice. “The root of every healing system known to man is Ayurveda,” Vidal points out. “It’s all about energy, our fundamental nature as energy. Yoga is an eternal tradition, based on universal laws and truth.” Thousands of years before modern medicine provided scientific evidence for the mind-body-spiritual connection, the sages of India developed Ayurveda, which continues today to be one of the worlds most sophisticated and powerful health systems. Ayurveda is a science of life and offers wisdom designed to help people stay vibrant and healthy. 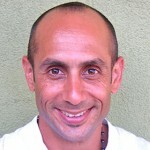 Mas is best known for his appearance in the documentary AWAKE, about Paramahansa Yogananda and his Autobiography of a Yogi. Yogananda is noted for bringing yoga to the United States in the early 1900s. This detoxifying yoga practice is an Ayurvedic approach to Hot Yoga, however most the heat comes from with in. Learn how to awaken your inner fires (agni’s) to cleanse every morsel of your physical and energetic body. Experience a mindful Ayurvedic yogic approach to purifying your body of toxins, excess fat and phlegm through a practice infused with special combinations of postures and sequences and powerful breathing techniques in a warm body and warm room. Experience how asana and pranayama can be interwoven to enhance the quality of your yoga practice according to your body-mind type (dosha). Based on Mas’s new book, this interactive workshop explores life’s eternal theme on the relationship between spirit and nature. The concepts of the Sun (soul), Moon (mind) and Earth (body) are woven into the lecture as metaphors for understanding the sciences of yoga and Ayurveda for the higher purpose of transcending our human experience towards the Divine. Learn about the history of Yoga and Ayurveda, the birth of the mind-body medicine and yoga therapy in the modern era and how yoga and Ayurveda are ideal systems for living a balanced life on earth. Be inspired by the dawn of a new astrological age that has only just begun and discover a new relationship with yoga postures, nature, animals, your diet, lifestyle and cultivate a deeper understanding of your life purpose or dharma. Mostly lecture, guided meditations, song & story telling, & book signing. 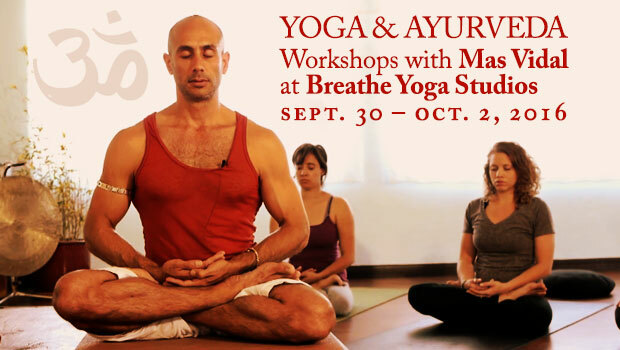 Learn how devotion or Bhakti Yoga can be integrated into a dynamic vinyasa yoga practice. Postures and breath-work are enhanced when practiced with devotion and they can bring us into a sublime state of health and spirituality. Use of devotional bhajans (songs) and mantras in asana are sacred ways to balance prana, increase shakti (power) and balance the mind-body relationship. Practice yoga in a new way that connects you to feeling more love, compassion and devotion for all living things. Learn the key principles to managing your weight through diet, herbs, yoga and lifestyle regimen. This workshop addresses the concept of balanced weight or “loss” as is used in the west according to the science of tri-dosha. We will then explore various Ayurvedic remedies that can be applied according to the dosha type. Additionally, yogic techniques can be incorporated to enhance the balance of the digestive system along with lifestyle factors that provide an integral approach to health and wellness and spiritual development. Private Ayurvedic consults available with Mas on Thursday and Friday. Each session is approximately 60-70 minutes and is $195.00. We will have a FREE showing of AWAKE the documentary about Paramahansa Yogananda and his Autobiography of a Yogi. Yogananda is noted for bringing yoga to the United States in the early 1900s. Mas was interviewed in this documentary as an expert on Yogananda who follows his practices. To see a preview of AWAKE click here: Following the movie, we will have a Satsang (Satsang means company of the highest truth or a Guru) with Mas.